Southampton were formed in 1885 as St Marys Church of England Young Mens Association, once again they really did know how to put together a snappy name for a football team back then! Nicknamed "The Saints" it is a name that has stuck with them ever since, as well as the red and white shirts. From 1898 until 2001 they played home games at The Dell, a stadium renowned across the whole UK for the atmosphere it created with fans almost on top of the pitch. 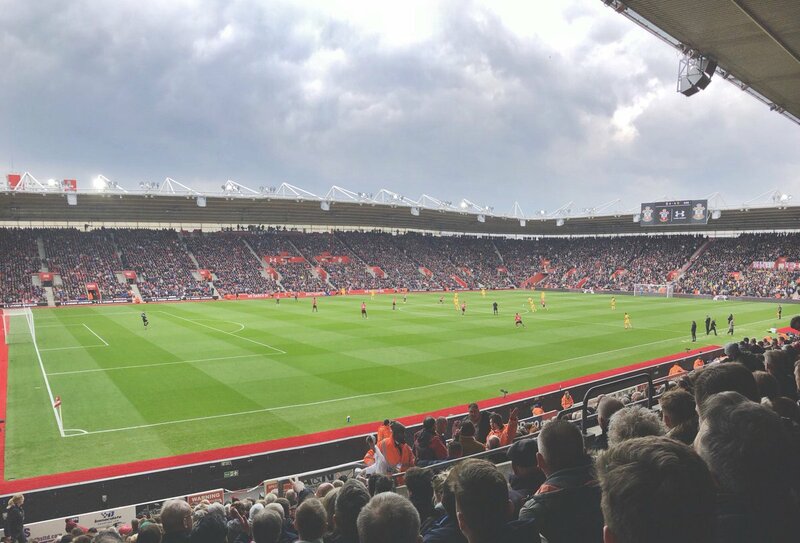 In 2001 they moved to the modern St Marys stadium, whilst it took a little while to adjust it in itself has its own unique atmosphere. 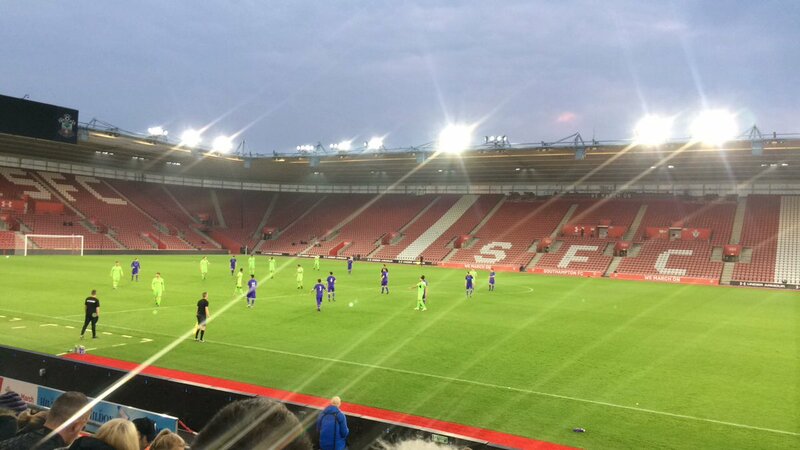 Most fans enjoy a trip to St Marys if for no other reason than all seats afford a good view of the pitch, something which has been lost amongst some of the larger modern stadiums. You have to go all the way back to 1976 for Southamptons last major trophy, their one and only FA Cup win. In modern times they have almost become an academy of creating England's best young players. Unfortunately they tend to be sold on leaving managers disheartened but you've got to give them massive credit for producing good team after good team when so many players are gone each summer. In particular many scousers like to joke about Southampton being a feeder club for Liverpool, something which doesn't go down well amongst the home fans. 90'+5' - Second Half ended - Southampton 3, Wolverhampton Wanderers 1. 90'+5' - Shot blocked. Morgan Gibbs-White - Wolverhampton Wanderers - shot with right foot from outside the box is blocked. Assist - João Moutinho. 90'+4' - Missed chance. Willy Boly - Wolverhampton Wanderers - shot with the head from the centre of the box missed. Assist - Adama Traoré with a cross . 90'+4' - Romain Saïss - Wolverhampton Wanderers - won a free kick in defence. 90'+2' - Raúl Jiménez - Wolverhampton Wanderers - won a free kick in attack. 90'+1' - Shane Long - Southampton - won a free kick in attack. 89' - Jan Bednarek - Southampton - won a free kick in attack. 87' - Substitution - Wolverhampton Wanderers. Hélder Costa for Diogo Jota. 84' - Substitution - Southampton. Jack Stephens for Yan Valery - injury. 81' - Delay in match Yan Valery - Southampton - - injury. 81' - Morgan Gibbs-White - Wolverhampton Wanderers - won a free kick in defence. 80' - New attacking attempt. Jan Bednarek - Southampton - shot with right foot from few metres is saved in the right corner. 79' - Corner - Southampton. Conceded by Willy Boly. 78' - Shot blocked. Nathan Redmond - Southampton - shot with right foot from the left side of the box is blocked. 77' - João Moutinho - Wolverhampton Wanderers - won a free kick in defence. 76' - Leander Dendoncker - Wolverhampton Wanderers - won a free kick in defence. 75' - Corner - Southampton. Conceded by Adama Traoré. 74' - Romain Saïss - Wolverhampton Wanderers - receive yellow card for a foul. 74' - Shane Long - Southampton - won a free kick in attack. 74' - New attacking attempt. Maya Yoshida - Southampton - shot with left foot from few metres is saved by goalkeeper in the centre of the goal. Assist - Oriol Romeu. 74' - Missed chance. Oriol Romeu - Southampton - shot with right foot from the centre of the box missed to the left after corner. 73' - Corner - Southampton. Conceded by Romain Saïss. 71' - GOAL!!! Southampton 3, Wolverhampton Wanderers 1. Shane Long - Southampton - shot with right foot from the right side of the six yard box to the centre of the goal. Assist - Maya Yoshida after corner. 71' - Missed chance. Maya Yoshida - Southampton - shot with right foot from the centre of the box is close, but missed after corner. 71' - Missed chance. Maya Yoshida - Southampton - shot with right foot from the centre of the box missed after corner. 70' - Corner - Southampton. Conceded by Romain Saïss. 69' - Substitution - Wolverhampton Wanderers. Morgan Gibbs-White for Rúben Neves. 69' - Missed chance. Raúl Jiménez - Wolverhampton Wanderers - shot with right foot from the centre of the box missed to the left after corner. 68' - Corner - Wolverhampton Wanderers. Conceded by Jannik Vestergaard. 67' - Jonny - Wolverhampton Wanderers - won a free kick in defence. 67' - Ryan Bertrand - Southampton - receive yellow card for a foul. 67' - Rúben Neves - Wolverhampton Wanderers - won a free kick in defence. 66' - Offside - Wolverhampton Wanderers. Romain Saïss with a pass, however Raúl Jiménez is in offside. 61' - Substitution - Southampton. Oriol Romeu for Josh Sims. 61' - Substitution - Southampton. Shane Long for Danny Ings. 60' - Substitution - Wolverhampton Wanderers. Adama Traoré for Matt Doherty. 59' - Missed chance. Jonny - Wolverhampton Wanderers - shot with right foot from outside the box missed after corner. 59' - Shot blocked. Matt Doherty - Wolverhampton Wanderers - shot with left foot from outside the box is blocked. 59' - Corner - Wolverhampton Wanderers. Conceded by Yan Valery. 55' - Offside - Wolverhampton Wanderers. João Moutinho with a pass, however Matt Doherty is in offside. 54' - James Ward-Prowse - Southampton - won a free kick on the left wing. 52' - Shot blocked. Rúben Neves - Wolverhampton Wanderers - shot with right foot from outside the box is blocked. 52' - Corner - Wolverhampton Wanderers. Conceded by Josh Sims. 49' - Leander Dendoncker - Wolverhampton Wanderers - won a free kick in attack. 48' - Missed chance. Diogo Jota - Wolverhampton Wanderers - shot with left foot from the centre of the box missed to the left. Assist - Jonny. 46' - Diogo Jota - Wolverhampton Wanderers - won a free kick in attack. 45' - Second Half starts Southampton 2, Wolverhampton Wanderers 1. 45'+3' - First Half ended - Southampton 2, Wolverhampton Wanderers 1. 45'+2' - Raúl Jiménez - Wolverhampton Wanderers - receive yellow card for a foul. 45'+2' - Pierre-Emile Højbjerg - Southampton - won a free kick in attack. 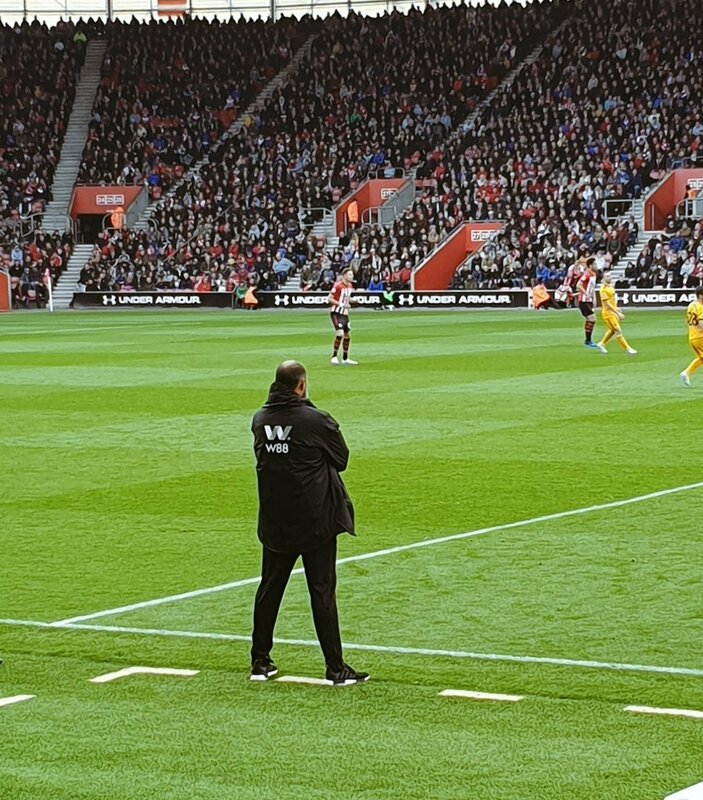 45'+1' - Angus Gunn - Southampton - won a free kick in defence. 44' - Corner - Wolverhampton Wanderers. Conceded by Jannik Vestergaard. 44' - Missed chance. Pierre-Emile Højbjerg - Southampton - shot with left foot from outside the box missed to the left. Assist - Yan Valery. 40' - João Moutinho - Wolverhampton Wanderers - receive yellow card for a foul. 39' - Nathan Redmond - Southampton - won a free kick in attack. 35' - Missed chance. Rúben Neves - Wolverhampton Wanderers - shot with right foot from outside the box is close, but missed to the left after corner. 35' - Corner - Wolverhampton Wanderers. Conceded by Ryan Bertrand. 32' - Missed chance. Josh Sims - Southampton - shot with right foot from outside the box missed. Assist - Danny Ings with a through ball following a fast break. 31' - Missed chance. Josh Sims - Southampton - shot with right foot from the right side of the box missed to the left. 30' - GOAL!!! Southampton 2, Wolverhampton Wanderers 1. Nathan Redmond - Southampton - shot with right foot from the centre of the box to the right corner. Assist - Danny Ings with a through ball. 28' - GOAL!!! Southampton 1, Wolverhampton Wanderers 1. Willy Boly - Wolverhampton Wanderers - shot with the head from the centre of the box to the right corner. Assist - João Moutinho with a cross after corner. 27' - Corner - Wolverhampton Wanderers. Conceded by Maya Yoshida. 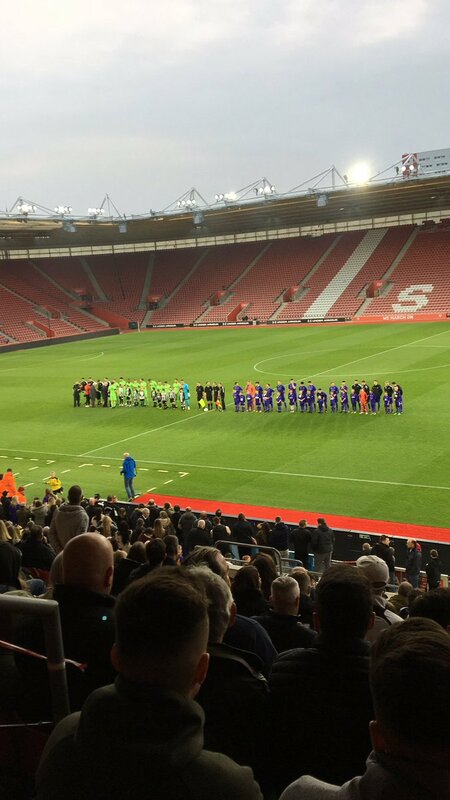 25' - Delay in match Nathan Redmond - Southampton - - injury. 24' - Shot blocked. Rúben Neves - Wolverhampton Wanderers - shot with right foot from outside the box is blocked. 24' - Corner - Wolverhampton Wanderers. Conceded by Ryan Bertrand. 19' - New attacking attempt. Raúl Jiménez - Wolverhampton Wanderers - shot with left foot from outside the box is saved in the right corner. 18' - Missed chance. Romain Saïss - Wolverhampton Wanderers - shot with left foot from outside the box missed to the left. 17' - Corner - Wolverhampton Wanderers. Conceded by Maya Yoshida. 17' - Shot blocked. Diogo Jota - Wolverhampton Wanderers - shot with left foot from the left side of the box is blocked. Assist - Willy Boly. 15' - João Moutinho - Wolverhampton Wanderers - won a free kick in defence. 15' - New attacking attempt. Nathan Redmond - Southampton - shot with right foot from outside the box is saved in the right corner. Assist - Danny Ings. 14' - Maya Yoshida - Southampton - won a free kick in defence. 13' - Raúl Jiménez - Wolverhampton Wanderers - won a free kick in attack. 10' - Missed chance. Leander Dendoncker - Wolverhampton Wanderers - shot with the head from the centre of the box is close, but missed. Assist - João Moutinho with a cross . 9' - Leander Dendoncker - Wolverhampton Wanderers - won a free kick on the right wing. 7' - Missed chance. Willy Boly - Wolverhampton Wanderers - shot with the head from the centre of the box missed to the left. Assist - João Moutinho with a cross after corner. 7' - Corner - Wolverhampton Wanderers. Conceded by Jannik Vestergaard. 7' - Shot blocked. Rúben Neves - Wolverhampton Wanderers - shot with right foot from outside the box is blocked. 7' - Shot blocked. Matt Doherty - Wolverhampton Wanderers - shot with left foot from the centre of the box is blocked. Assist - Leander Dendoncker. 4' - Willy Boly - Wolverhampton Wanderers - won a free kick in defence. 2' - GOAL!!! Southampton 1, Wolverhampton Wanderers 0. Nathan Redmond - Southampton - shot with right foot from few metres to the top right corner. Assist - Josh Sims.